One, if not the favorite food of Mako Sharks is Swordfish which lay on the surface and sun themselves during the day. When a Mako attacks them (or Dolphins which is also common), they go straight for the tail and take out their propulsion. Smart thinking for the sharks but scary as hell for Swords and us. Great photo and story. 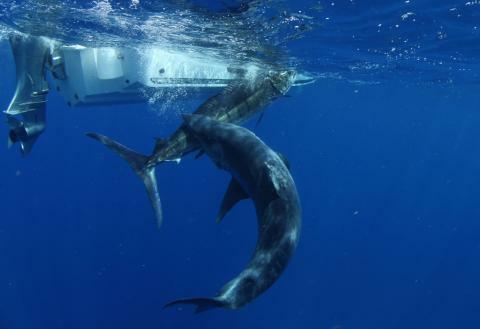 Apparently when they were fighting the Marlin they could see another blip on the depth recorder and when Al got in the water to do some video of the Marlin alongside this Mako came up and had his way with it. There is some video floating around too which is pretty sick. Kudos to Al for scoring some great footage and having the satchel to stay in the water and get the shot.